What is the Definition of a Peril in Insurance? Definition of "Perils" in insurance refer to hazards and events that are a source of loss or damage. It basically describes things that can happen, depending on if it is an insured peril or not, it also helps you understand what is covered on your insurance policy. Perils are also referred to as "risks". Your insurance policy will refer to "perils" in your policy contract. The term "insured peril" refers to risks or sources of damage that are "insured". Perils may also refer to the source of an injury for which you may be held liable. Not all perils are covered on a policy, but sometimes maybe added by endorsement, for example with earthquake insurance. Your insurance policy must specify what is covered or not. The term peril is used in many contexts, aside from the definition, it may be used to describe the type of insurance policy form you have. Insured perils will always be specifically outlined in an insurance policy, which the exception of an "All Risk" policy which takes an alternate approach by insuring "all risks" or "all perils" and therefore only lists all the perils that are not insured as exclusions. Most insurance policies may list "Named Perils" or "Insured Perils", this defines what you are insured for. Not all perils are insured on an insurance policy, perils that are uninsured or excluded may be referred to "uninsured perils" or "risks" or exclusions. For example, perils such as flood, earthquake, damage caused by mold, damage caused by insects, may all be perils, however they may be excluded from a residential insurance policy for a homeowner, renter or condo owner. Some perils or risks may be added by endorsement or rider. A peril is the choice word used by insurance contracts to explain what risks the insurance contract will cover. A homeowner policy will assign coverages to the building portion of the policy and the contents portion of the policy. It should not be assumed that because one portion of coverage has all perils insured, that the other will as well. In a named peril insurance policy, the insurance policy will only provide insurance coverage on losses due to particular perils or damages that are specifically named in the insurance policy. It is important to understand what perils you are insured so you know what to expect in a claim. Since the named peril insurance policy only covers specific perils, it is usually less expensive than an all risk or all peril insurance policy. Additional coverages may sometimes be added by endorsement. An Open Perils, All Risk or All Peril insurance policy is an insurance policy that covers all perils except perils that are specifically excluded in the insurance policy. The all risk insurance policy is usually more expensive than the named peril policy because it is more comprehensive than the named peril insurance policy. It usually has significant advantages over a named peril policy because of its more extensive coverage, sometimes including higher special policy limits. Where Do You Find What Perils Are Insured on Your Insurance Policy? Your insurance policy declaration page will show you what type of home insurance policy you have: Open Perils or Named Perils based on the policy form listed. The insured perils will be fully listed along with the excluded perils and conditions in the policy wording which will follow the declaration page of your policy. Fire: Something that produces a spark, flame or glow. Not smoke. Direct damage due to hostile fire is covered under the fire peril. Hostile fire is a fire that burns where it is not intended to burn such as a bed or curtains. Lightning: Defined as natural electricity. Lightning directly damaging something or fire caused by lightning are both covered under the lightning peril. Also, damage to the electrical system or appliances in a home due to a lightning strike would also be covered under the lightning coverage but not if the electrical problem comes from the company providing the power. Explosion: Coverage for an explosion can vary depending on the insurance policy but generally refers to explosions that originate within the covered structure but can also sometimes include explosions that originate outside of the structure and cause damage to the covered structure. 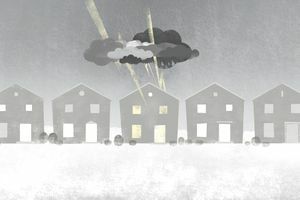 Windstorm: Damage due to wind including cyclones, tornadoes and hurricanes and covers the outside of the property and the inside of the property if the wind causes an opening to the inside. Does not include damage due to floods. Hail: Damage caused directly from hail. Hail coverage to the inside of a structure is only covered if the hail itself breaches the structure and causes internal damage so if the hail enters because of an open window, the damage to the interior due to the hail from the open window would not be covered. Riot or Civil Commotion: A riot is usually defined by three or more people causing damage to a property and a civil commotion is usually defined as damage caused by a large number of people. Aircraft: Damage caused by any flying machines including balloons, helicopters, airplanes, spacecrafts, and self-propelled missiles. To learn more about the different options of coverage in home insurance policies you may continue reading Understanding the Perils Insured by HO-2. HO-3 and HO-5 Homeowner Policies.